Mate 10 pro still on Emui 8.0. I thought it should be on 8.1 but it dmsays I'm o right update. However I don't believe it also when is mate 10 pro getting pie cause some some phones in China have already got it so why as ain't we. Thank you for sharing the screenshot. 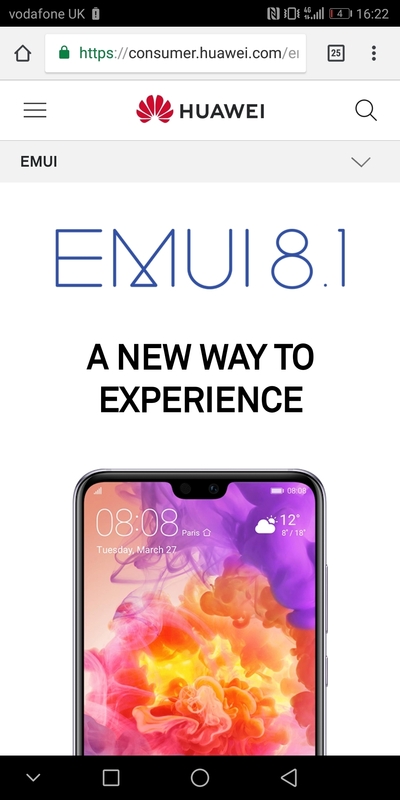 The EMUI 8.1 feature applies to the P20 and the P20 Pro, which come with EMUI 8.1/Android 8.1 pre-installed. The Mate 10 Pro, on the other hand, only comes with EMUI 8/Android 8 installed. Therefore, it will only receive update packs for the 8 version, until it will be eligible to receive the Android Pie update, which will be further down the road. However, we have no information at the moment as to when that will happen. Updates do not get released worldwide all at once. They get released in batches across regions. That way if a bug has got through then affected devices are few. Also, server loads are minimised. Do you know what is coming in the new update? Glad to hear that you are using the Mate 10 Pro and that you are interested in its improvement through a system update. @Max are you sure. This screenshot from Huawei says different. I'm seriously unhappy about Huawei saying mate 10 pro will not get 8.1 oreo when on numerous tech websites Inc huawei own are putting out articles saying it is way back in June!!! Plus I purchased an Android phone and Hauwei have a responsibility to pass on all android updates Inc oreo 8.1 cause if they don't it means Hauwei phones are not really fully android. I also believe that Hauwei have been misleading with press releases in order to gain more sales and now many of those customers who were duped by this are regretting there choice. I would not have chosen Hauwei if had known they would be so disappointing, I'd always in past had Google phones and wish I'd stuck with them but thought I would get all updates although expectedly later than Google phones. Can you tell me who to contact to request a replacement phone with up to date android system or get a refund... As believe I have been missled and Hauwei have not provided a phone as its described and advertised. I definitely will no longer buy Hauwei in future unless its been proved that there providing proper updates and will not be recommending to family and friends anymore like I have done and 4 people went Hauwei on my recommendation and I'm sure many other unhappy customers will start doing the same. Can someone tell me how to get a straight answer on here that actually provides useful information and not just fobbed off. I would like to know when I'm going to get update to oreo 8.1 I do not accept that mate 10 pro is not getting it when I have read on numerous tech websites including huawei own website that I should of had it by now. If I don't receive it I believe huewai has not provided a product(mate 10 pro), that I was sold, that is as described as an android phone, an android phone that does not get the major android updates!! This is not acceptable and I want to know how huewai will put this issue right for me and the many other huawei customers who have same and similar issues. False advertising may be permitted in China but its not in majority of the world Inc UK. I bought the phone in good faith and expect huewai to be honorable. I would not have bought a huewai phone if knew was gonna have this problem and would not have recomended huewai to several friends and family 4 of whom went ahead bought huewai phones. So as how I started this message I again ask for a proper answer and solution and not a fob off meaningless pass the buck answer. So please make sure you get someone with some knowledge and decision making authority to reply to me pls. BLA-L29 8.0.0.129(C576) Im from israel can you check please when the update is going to show up ? Regarding software updates: At the moment we cannot give support on software updates on the Huawei Community. Waiting on a software update? Please contact our support team directly. Phone the Hotline: 08000 886 700 Mon - Fri 09:00 - 21:00, Sat. 9:00~17:00 (Except bank holidays). The support team will create an update request for you, if possible. Are you outside the UK? Please contact the support team in your region.